There are several “inconvenient truths” contained among the details of a recently released synopsis of college education and work trends, courtesy of the Heritage Foundation. Let’s check them off one-by-one. These costs have been rising fairly steadily for years now, seemingly without regard to the overall economic climate. But the negative impact on students has been muted somewhat by the copious availability of student loans — at least in the short term until the schedule kicks in. The other important mitigating factor is the increased availability of community college education covering the first two years of higher education at a fraction of the cost of four-year institutions. 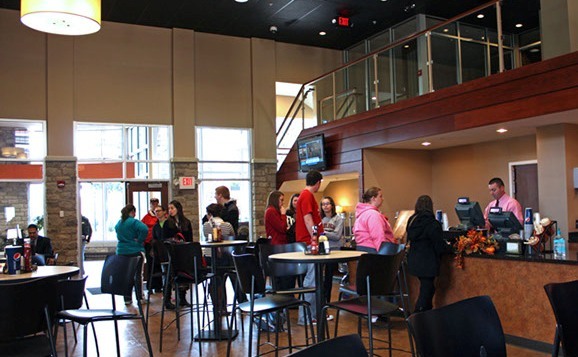 Less attractive are “for-profit” institutions, some of which have come under intense scrutiny and negative publicity concerning the effectiveness of their programs and how well students do with the degrees they earn from them. What may be less understood is the degree to which “full-time college” is actually a part-time endeavor for many students. According to data compiled by the Bureau of Labor Statistics over the past decade, the average full-time college student spends fewer than three hours per day on all education-related activities (just over one hour in class and a little over 1.5 hours devoted to homework and research). It adds up to around 19 hours per week in total. In essence, full-time college students are devoting 10 fewer hours per week on educational-related activities compared to what full-time high school students are doing. 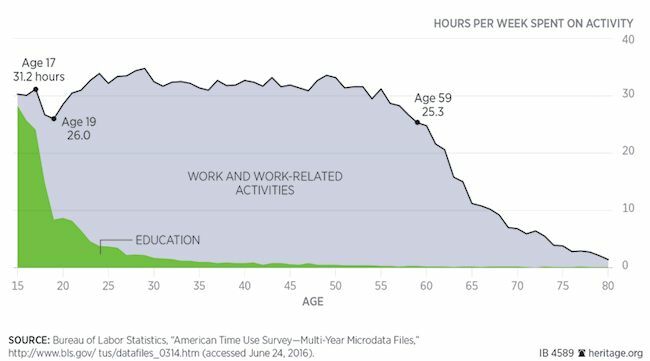 Lest this discrepancy seem too shocking, this is this mitigating aspect: When comparing high-schoolers and full-time college students, the difference between educationally oriented time spent is counterbalanced by the time spent working. More to the point, for full-time college students, employment takes up ~16 hours per week whereas with full-time high school students, the average time working is only about 4 hours. Here’s where things get quite interesting and where the whole idea of the “college bubble” comes into broad relief. It turns out that full-time college students spend far less combined time on education and work compared to their counterparts who are full-time workers. Here are the BLS stats: Full-time employees work an average of 42 hours per week, whereas for full-time college students, the combined time spent on education and working adds up to fewer than 35 hours per week. On average, 19-year-olds are spending significantly fewer hours in the week on education and work compared to 17-year-olds. It isn’t until age 59+ that people are spending less time on education and work than the typical 19-year-old. No doubt, some social scientists will take these data as the jumping off spot for a debate about whether a generation of “softies” is being created – people who will struggle in the rigors of the real world once they’re out of the college bubble. Exacerbating the problem in the eyes of some, student loan default rates aren’t exactly low, and talk by some politicians about forgiving student loan debt is a bit of a lightning rod as well. The Heritage Foundation goes so far as to claim that loan forgiveness programs are leaving taxpayers on the hook for “generous leisure hours,” since ~93% of all student loans are originated and managed by the federal government. What do you think? The BLS stats don’t lie … but are the Heritage Foundation’s conclusions off-target? Please share your thoughts with other readers here. ← Online shopping insights: Why is the in-store pick-up option so popular? Let’s not forget, adult workers usually consider their jobs to be careers worthy of full-time concentration. College students, even those holding jobs, regard them as secondary for the time being. Hence fewer measurable “work” hours. Students are busy exploring things which will make for educated people in the end — but which might seem to be social or leisure activities at the time. Students may not spend many hours in class, but they are still doing the work of learning. Perhaps they have discovered pianos in the music building, or politics, or fallen in love with art, or discovered friends to argue with about all of it. Intellectual development requires free time, especially in the liberal arts. A college education doesn’t involve measurable transfer of knowledge — something one can assess like a time-and-motion study. It’s about the building of a mind. The measurable benefits for society of that come later…. I think it’s possible that some college students are not being challenged enough. I’ve been told by some of our summer interns how difficult it is to sit at a desk and work an 8-hour day!